Here is a book that many people hate, and yet, it is one of my favorite books of all time. Sadly, the people who hate this book were most likely forced to read it in high school. I often bemoan the fact that I came to love many classics later in life, but I've also come to realize that if I had read this in high school English, it's quite likely I would have hated it as well (probably because the American Authors teacher was a terror; I took World Lit because I'd had that teacher for composition sophomore year and really liked him). At any rate, I was happy reading Candide and 1984 (though The Mill on the Floss was a BIG mistake on my part) and my friends were suffering through The Scarlet Letter. Nevertheless, I finally found Edith Wharton about seven years ago. I read The Age of Innocence while on vacation in the Florida panhandle, but somehow, it didn't do much for me. I really didn't get how wonderful Edith Wharton was until I read House of Mirth about a year later, which I could hardly put down. Soon after I read Ethan Frome in a single sitting, and I've loved it ever since. Since then I've enjoyed more Wharton, a writer who can write both heartbreaking novels, ghost stories, and wry and witty short stories -- if you don't believe me, just Google "Xingu" and try to read it without cracking a smile. But, back to Ethan Frome. If you don't know the story, basically, it is about a young man trapped in terrible circumstances. (If you haven't read Wharton, this is pretty much the theme of her entire oeuvre.) Told with a framing device, in flashback and conjecture, we learn that when Ethan was in his late 20s, he was trapped in a marriage with an older woman, Zenobia, a shrewish hypochondriac. To help out, Zeena's distant cousin, Mattie Silver, had come to live with them, and Ethan is in love with her. Once Ethan had a promising future as an engineer or scientist, but he's saddled with debts on a farm he can't sell, and now there's really no way out for him and Mattie. Over the course of a few days, his life takes a tragic and ironic turn. I chose this book for the January read for one of our book groups, and I think it was a good choice. It's a short read, about 150 pages in most editions, and there's so much to discuss -- loaded with symbolism and great characterization. Also, Wharton is just masterful at setting the scene. I live in south Texas where we rarely get a hard freeze, much less a dusting of snow, and I just felt freezing cold while reading this book. It brought back a lot of memories of winters I've spent in the Midwest -- about ten years ago we were stationed in Nebraska, and this story could have easily been relocated to the bleak, windy prairies. I love Ethan Frome, but it always makes me wonder why I'm so attracted to it. What does it say about me, if I love Wharton -- her stories are so tragic! She does tend to write variations on the same story over and over, but she does it so well. I've read about about seven of her novels, and I've loved most of them. Sadly, I can only think of one that has a happy ending -- and that was her unfinished novel, The Buccaneers, which was finished by another author based on Wharton's notes. I still have Twilight Sleep and The Glimpses of the Moon on the TBR shelves, plus The New York Stories of Edith Wharton, an NYRB Classic. I want to read at least one of these this year. There's a chance I may even get to visit Wharton's estate, The Mount, in the Berkshires this summer -- but that's still in the planning stages. So, who else is a fan of Edith Wharton? Do you love Ethan Frome, or hate it? And has anyone been to The Mount? 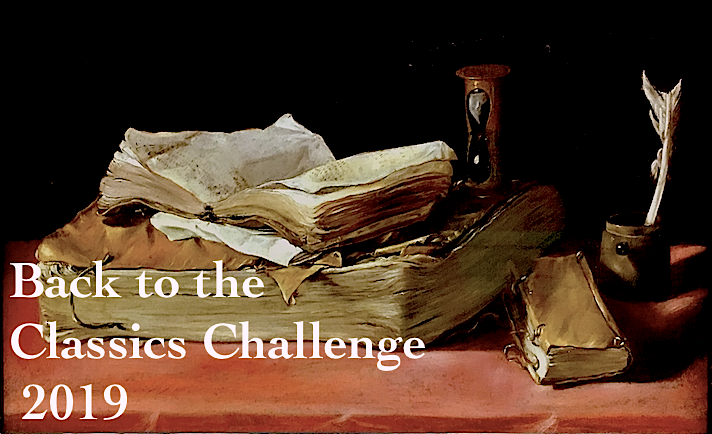 This is the first book I've completed for the Back to the Classics 2013 Challenge. Sadly, I did have to read Ethan Frome in high school and hated it, but I adored Age of Innocence a few months ago and am currently in the middle of the truly lovely Glimpses of the Moon. Perhaps it's time for me to try this novella again. Thank you for the encouragement, and for a great review. Samantha, you should really try it again!! It's just beautifully tragic. But you've made my point exactly -- forced to read it in high school, and hated it. I can sort of understand why it's chosen for high school reading, short, classic, etc., -- but I think you have to be an adult to appreciate it. I really do need to read more Wharton, so I think Glimpses of the Moon will be next. I'm halfway through The House of Mirth -- I read it in college, but not since, so it's like reading it for the first time. It's amazing, wonderful... (I just read the scene where Selden has dinner in Gerty's flat... heartbreaking!) I'm coming to like the short stories too (just never a genre that I've spent enough time with). I hope you'll let me know if you do plan your visit to the Mount, since it's a day trip for me and I think there are others of "us" who might hope to meet up there! I'm also reading R.W.B. Lewis' biography of E.W. He was my professor in college (he's the reason I got to know about Edith) and though his biography isn't the most recent one, it's SO well written and I think it was the first major scholarly biography that was written about her. I just loved House of Mirth, sigh. And I did see on your blog that you're reading Lewis' bio of Wharton. I need to add it to the to-read list -- the Hermione Lee bio is pretty intimidating. I will definitely let everyone know if I go out to the Mount. It would be so fun to meet up! I read "Ethan Frome" many many years ago and loved it. At my suggestion a book group I was in many years ago read it as a winter selection. No one else like it. The usual, it is too dark, continued to be repeated. I am actually reading "The House of Mirth" at present for my book group. No one was looking forward to it but me. Different set of women...I can't wait for the discussion. So happy to meet someone else who appreciated "Ethan Frome". Happy reading! We didn't have a huge turnout for the book group, but those that showed up really enjoyed it. It's too bad when people won't even give books a try. I hope your latest group appreciates House of Mirth, it's one of my all-time favorites. Now I want to read it again! Prefer House of Mirth! I think Ethan Frome firmly established Wharton as a great writer, but oh the ending! I find it so unsettling. Edith Wharton was just masterful at the ironic twist ending. Have you read her short stories? Roman Fever in particular is just brilliant. I hate Ethan Frome because I had to read it in school with a teacher I hated! But I love Wharton, having read The Age of Innocence and a collection of short stories with plans to read The House of Mirth soonish. I am wary of trying EF again just because I loathed that teacher so much and kind of hate everything associated with that class. My point exactly!! I used to regret that I'd missed so many books but I probably would have hated them anyway if I'd been forced to read them in high school. I chose The Mill on the Floss for a lit project and ended up hating it. I'm still terrified of it, though I loved Middlemarch. Someday I'll try it again, but it'll be a loooong time. Karen, I think you would enjoy the biography of Edith Wharton by Connie N. Wooldridge. It's a YA bio called The Brave Escape of Edith Wharton. There are dozens of photographs as well. I saw that in the library catalog! Thanks for the recommendation. I imagine your love for Ethan Frome is a testament to the power of great writing. On the surface, it really is an awful story--I don't much Ethan myself, and feel as if he got what was coming to him, but non-charitable thoughts aside, it is beautifully written and the banal story becomes compelling and heartbreaking. I reread it a couple of Januarys ago, and like it so much better than I did in high school! It hasn't been on my kids' reading lists, however. I keep waiting for my daughter to read one of my favorites. . . I was so annoyed when she ended up NOT reading To Kill a Mockingbird! When she was in 8th grade, they switched it to 9th grade, but when she got to 9th grade, they'd switched it back so her whole class never read it. Hmpf. We did read East of Eden together last summer which was pretty good. Karen – I’m so glad you decided to give Ethan Frome a try! I know many others who read the book in adulthood and appreciated it much more than they might have (or did) as teenagers. 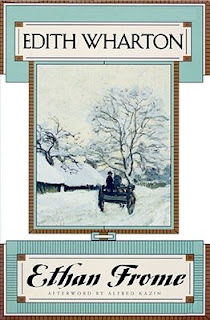 For those looking to enjoy Ethan Frome in one sitting, The Mount will be hosting a marathon reading on February 23. The winter is absolutely the best time to read Wharton’s chilly novella, and I hope some of you in the northeast can join us as readers or audience members next month. If Ethan isn’t your cup of tea, 2013 marks the centennial of The Custom of the Country, one of Wharton’s strongest and most divisive novels. The Mount will be releasing chapters each month with special annotation and commentary from Wharton scholars, Mount staff, and others. If you’re looking for another Wharton title to read, I highly recommend this one! 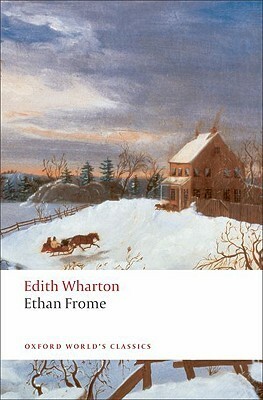 I loved Ethan Frome as well and almost felt like I shouldn't have if you can understand what I mean. I hate Ethan Fromme with a passion, and it's precisely because of what you said - I was forced to read it in high school (along with other such terrors as Sister Carrie and Far from the Madding Crowd). Here's the thing I have come to believe - high school students are not equipped to appreciate most of the stuff they're forced to read (and sadly, many high school teachers don't find a way to make the books appreciated). We need to revise the literature curriculum in this country so that kids can read stuff that will make them love reading - and they can come to these classic books later when they have the emotional maturity to understand them. Making kids read this tragic realist stuff (often) just makes them hate reading. Wharton is high on my list to read more of. I've only read this one. I did like it, but I really got a kick out of the parodies I found on youtube. TOO FUNNY. When I attended the Boston Book Fest, I sat in on discussion of Wharton and all the new books out there either new versions of her books or about her. She is an interesting author. 2012: My year in reading.